The card above is of the Rathaus Plaza, Augsburg, Germany. 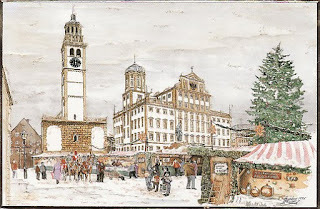 The clock tower, and the town city hall ~ the birth place of the author of this blog. Augsburg is over 2000 years old - each and everyday during the holiday season, I keep this ~ webcam ~ of the plaza up on my computer. And right now, the Christmas market is alive and bustling. It's like being right there! Keep in mind they are nine hours ahead, best time to view the webcam has been around nine a.m. California time. The Christmas lights, the street cars and the huge Christmas tree is a sight to behold. My Oma lived very close to this plaza. I remember walking around the shops on a trip back home when I was just thirteen. There are webcam's all over the world, it's amazing to watch them. 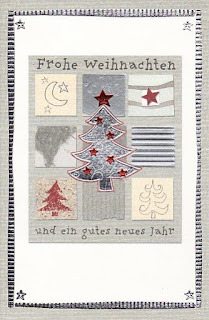 This card and tag, was made by my cousin Marion, we share the love of cardmaking! I have had a passion for cards ever since I was a very little girl. I love making cards, sending them and receiving them. It's probably safe to say that I have an addiction to cards as much as I have to genealogy now! I have gone so far as keeping most cards that have been given to me. I have gotten better, and I pick and choose what I keep now. I have created a system so it is not out of control! I hunted high and low for a file box that was pleasing to look at, currently it's a Victorian floral. I use a file folder with a label for each person. Those pretty file folders are what holds each precious card I keep. I can go back, read and look at each card and letter anytime. It feels as if I am with that person for a little while. Cards are very important to me. I can remember as far back as the third grade when I penned a thank you card to my best friend Sandy's mom for letting me spend the night. It is said that Nita, who is like a second mom, still has that thank you note. I am going to ask her because I would love to see that one! I always gave a thank you card for the littlest things, or just a card to say hello ~ I am thinking of you ~ get well ~ any reason at all. Christmas is the best time. Each day receiving a card is exciting and I look forward to opening it. I use a letter opener, never tearing the envelope! I write the date received on the card and when I responded. I know I am a bit weird, but I told you, I have a thing for cards. I started out with store bought cards and added stickers, not the cutesy kind but Victorian die cut type of stickers. Then I went on to stamping and embossing, then I would do both! 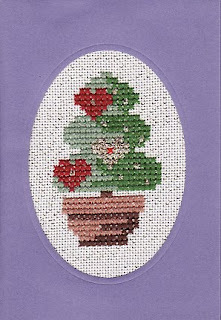 Now I try and make my own cards as time permits. I enjoy the "hands on" feel of the paper and personalizing the card to each person or event. I am slowly learning digi-scrapping as I would like to learn to do some cards on my computer. I knew the ones I wanted to focus on were the ones from my Oma Lieselotte, my aunt Gitta, uncle Adi, and my cousin Marion ~~ all from Germany. As I was going thru the folders, I had many different emotions, I realized I hadn't visited these treasures in a long time, partly because my two twin uncles have passed, I miss them and life has just been busy. I am so glad I have kept all my cards. Sadly, I don't have the year this card was made. It was very difficult just to pick a few. There are so many beautiful cards to share that I could be here for a long time! You must have had a struggle to narrow down the wonderful choices of cards to feature for this blog post. I enjoyed reading it. Beautiful cards! I totally understand why you have saved them! 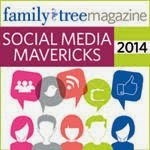 I am really enjoying reading about your Christmas memories! 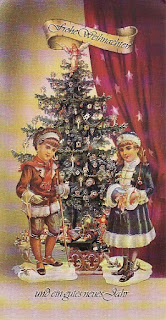 They remind me of my brief time living in Germany and how Christmas was my favorite time of year there. I miss the Christmas markets, gluhwein, the list goes on! This is a little off-topic. I think I'm brain dead because I can't even remember how I put pictures on backgrounds to make a collage -- and I've done it before. Then I read your posts and see these beautiful collages and wonder where you get some of your backgrounds. I know I've asked you before, but can you help an old lady out? And they are beautiful cards, but after all, I'm looking at Ginisology, right? OK -- even more stupid question. I see that your blog background comes from the Inspiration Gallery and I see a button for Valentine Design. Are those some of your main sources? Thank you, Amanda, Heather and Kathy . . . Christmas in Germany is amazing. 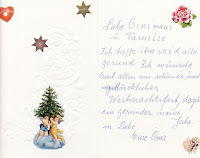 I have wonderful memories of Christmas in Germany with family, the Christmas Market and family traditions . . . it's like no other! Mom made sure to keep our German traditions here in California! Kathy, I removed the Karen Valentine link, I don't recall why I had it there but I have never used or had her create a blog design for me. I use Picasa for any of the collages I have made and then used here on my blog. I had a wonderful teacher, yet, I still have much to learn! I will send you a private email and help in any way that I know how to. 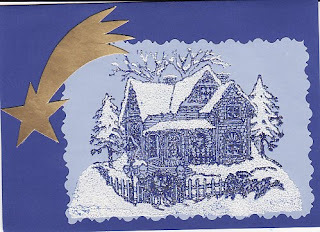 Happy Holidays to all, thank you for visiting. Gini, thanks for the idea of checking for Christmas webcams. I found some in the Rhineland too. My dream is to someday actually go to one of the German Christmas markets. I would take an extra suitcase because I know I'd want everything I saw. Thanks, Gini. I use picasa. Let me work a little harder. Thank you, Kathy and Elena . . . love cards, you might call me a card hoarder I guess! Kathy, the webcams are amazing. I could sit and watch for quite a while. When I found the Augsburg webcam of the Rathaus Plaza for my late mom, she said she could tell me the numbers on the street cars and where they were going! It made her feel as if she was home. The Christmas market is fun to watch and if you watch at a certain time, you can see the Angels come out on the balcony in the City Hall building (to the right of the screen) . . . it's just beautiful. Mom and I would watch them every Christmas. When visiting, an extra suitcase is a must!